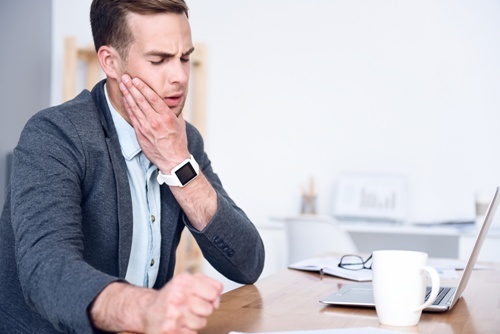 Temporomandibular joint disorder, commonly referred to as TMJ or TMD, is an often misunderstood condition that can affect many aspects of your life. It can be responsible for an array of symptoms, many of which may not seem directly related with jaw misalignment. During his training at the Las Vegas Institute for Advanced Studies (LVI), one of the most distinguished dental training institutions in the nation, Dr. Ogawa focused on several areas of advanced studies, including the treatment of TMJ/TMD. If you experience unexplained jaw pain, neck pain, migraine-like headaches or other TMJ-related symptoms, please contact Contemporary Dental Health today online or at 503-636-4069 to schedule an initial consultation with Dr. Ogawa. We proudly serve the Lake Oswego, West Linn and Portland communities of Oregon. TMJ is a condition caused by jaw misalignment and produces a variety of painful symptoms. These symptoms are the result of pressure on the facial nerves, most often the trigeminal nerve. This nerve is responsible for transmitting sensation to the jaw, eyes and sinuses. It affects the chewing muscles and can also cause lockjaw. If you experience any of these symptoms, please contact Contemporary Dental Health today. Dr. Ogawa will determine the cause of your symptoms and develop a customized treatment plan to restore your jaw to optimal health. One of the most common symptoms of TMJ is a headache. Jaw misalignment, and the resulting pressure on the trigeminal nerve, can cause painful, migraine-like headaches. If you have been unable to identify the underlying cause of your headaches, you may be suffering from temporomandibular joint disorder. Dr. Ogawa utilizes sophisticated technology and years of training and experience to identify and effectively treat TMJ. During your TMJ consultation, he will thoroughly evaluate your oral condition, identify any issues with your jaw or jaw muscles and design a customized treatment plan just for you. Why Choose Dr. Ogawa for Your TMD Treatment? Dr. Ogawa trained extensively at the Las Vegas Institute for Advanced Dental Studies, widely considered the premiere post-graduate dental training institution in the United States. As an LVI Fellow, Dr. Ogawa has completed the full core curriculum and is distinguished for exceptional skill and experience. The LVI curriculum involves the study of advanced techniques in neuromuscular and cosmetic dentistry, providing dentists with comprehensive knowledge of various dental practices and a unique skill set. Dr. Ogawa utilizes his skills as an LVI Fellow to develop effective, customized treatment plans for every patient. He knows that no two TMJ cases are identical, and he works to find the best treatment for each case with the most advanced technology and techniques available. To learn more about TMJ and the treatments available at Contemporary Dental Health, please call 503-636-4069 today to schedule a consultation with Dr. Ogawa. We welcome patients from across Oregon, including Lake Oswego, West Linn and Portland.